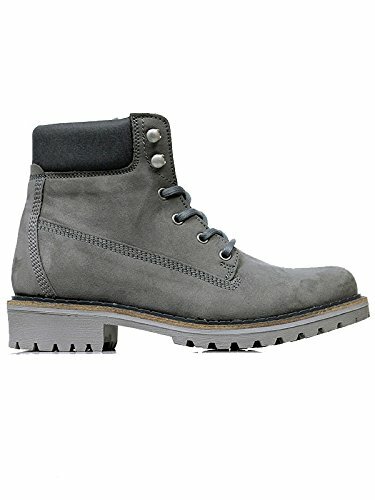 Looking for a solid pair of vegan work boots? Perhaps even ones with a with a steel toe? You’re in the right place! We’ve rounded up 15 of the top options for you right here. *Be sure to look for the advertised as vegan section of each boot. These brands openly state that these products are vegan so there’s no concern of hidden animal products in glues or dyes or anything. We always look for ZERO animal materials in the work boot, but you never know if any are hidden. 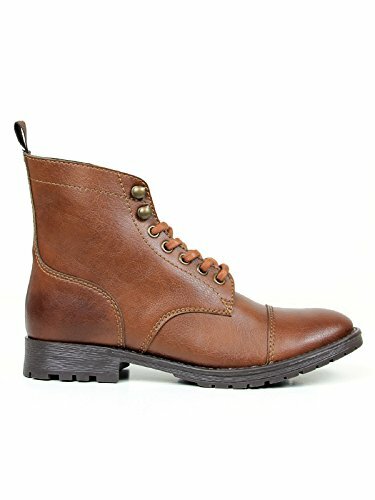 This boot has the classic work boot look. It has a sturdy microfiber construction that also helps to keep liquids out. These are also chemical resistant so if you’re working around hazardous materials these will keep your toes safe. It doesn’t have a steel toe, but it does have a toe cap which will help if you have the tendency to stub your toes in your work environment. They lace up, so you can make sure they’re nice and tight on your foot. For the most part, they’re pretty comfortable. They also have a good grip on the bottom so if things a little slick they should be able to hold up under pressure. 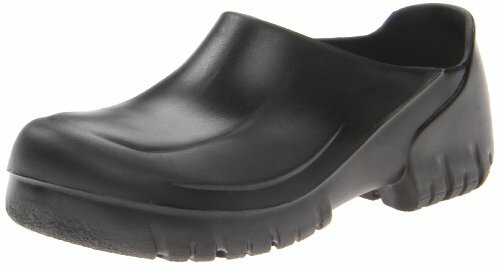 If you’re looking for a good slip-on work shoe than this is a great option. It’s a clog style so you literally put it on like you would a sandal or something. Now, if you need something with a bit more hold on your foot then opt out of these and get a boot instead. They don’t flop around everywhere but they are a bit looser than a classic boot. Still, they are really comfortable and offer a great grip. Despite being a looser shoe, they are slip resistant, so you won’t have to worry about spills. They’re made from recycled material and they’re very lightweight. Easily cleaned and they have an anti-fatigue footbed, so if you spend a lot of time on your feet these are great. These boots are definitely more than a little different. At first glance, you probably wouldn’t consider these to be a work boot, but a closer look at some of the features of this shoe will let you know it’s here to stand with the best of the best. They’re made from canvas and rubber and those giant straps across the boot are adjustable, so you can tighten them to your liking. The canvas upper is water resistant. These have a comfortable barefoot feel which can help reduce knee and back pain, according to the manufacturer, as well as assist with posture. They’re light and durable and you can fold down the upper portion of the boot if you don’t want them all the way up to your calf. They have a very rugged outsole for good grip and traction, as well. This is a classic boot. It comes right about the ankle for good stability and support. It’s made from hi-tech Italian future-leather. If you don’t know what that is, don’t be wary of the words “Italian leather,” it’s completely lab-grown, is more breathable and water resistant. It’s a PU microfiber superior to animal-derived leather. It doesn’t have any kind of steel toe, so this wouldn’t be a good move if you need that extra protection. But it is lightweight, has a durable and rugged outsole for slip resistance, and it ages wonderfully. 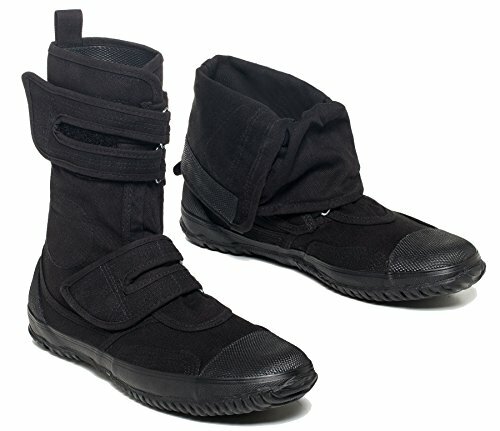 It’s also weather resistant, so these aren’t just good indoor boots, they work outdoors as well. This a really great work shoe if you’re looking for something that has more of a sneaker feel to it. It offers all of the same protection in a shoe that has a lighter weight than the average boot. It still has laces, so you can make sure it’s nice and tight on your foot. They are slip resistant so if you work in a wetter environment, they can keep you on your feet instead of on the floor. They also have a padded footbed, so you can stay on your feet longer if you have to. They also have a little bit of lift in them if that’s something you require for arch support. They do their best work in restaurant workplaces. If you need a heavy-duty boot to protect you around power tools or something of that nature, then this boot is for you. The upper part of this boot is made from lorica. It has Kevlar anti-cut protection, and around the midsole and it has pierce resistance. These also have a steel toe cap which is very important when working around power tools and dangerous equipment. They come up past your ankle, so they offer full support, as well as protection. The laces allow for you to make sure the boot is snug on your foot to prevent any accidents. These boots provide you with the waterproof protection that you have been so desperately searching for. They are almost like rain boots with more protection. These boots are made for farm work according to the site, but they would work well for any wet and muddy work that needed to be done. With blue daisies all over, this boot is not only functional but super cute. They’re constructed with 4mm Neo-Tech waterproof insulation, so they’re completely waterproof and also warm. It pulls on easily and has a Max-Wick lining so that your feet stay dry on the inside and outside. And if things do get a little sweaty in there, these are also lined with DuraFresh bio-technology, so it doesn’t get too smelly inside. It also has a non-slip sole, so when you’re done with the mud you can walk on solid ground without sliding around. Overall, it’s a great versatile boot. These have to be the best-looking work shoes of all the ones on the list. They literally just look like converse or any other sneaker. But they still have all the protection you would require in a strong and sturdy work boot. They’re water resistant and an anti-slip pattern on the outsole to keep you dry and on your feet in slippery conditions. The insoles are replaceable Eco-OrthoLite so that you can keep these nice, clean, and smelling good. They’re very breathable and machine washable if they get a little dirty. Cons: No toe protection, can be slightly uncomfortable. This boot is a really good-looking option for men. They have a classy look but still, have all the inner workings of a good quality work boot. 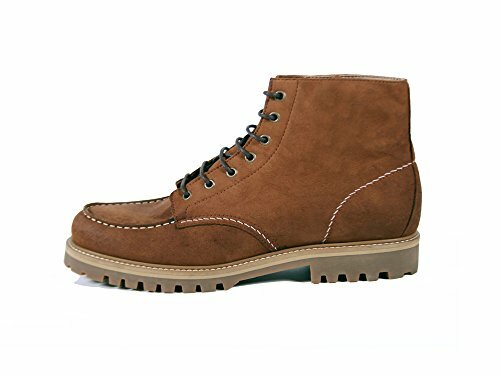 The upper portion of the boot is made from vegan leather, so it’s breathable while still maintaining water resistance. These insoles are not only cushioned they are hand stitched, so they’re very high quality. The bottom is made from rubber, but it’s lightweight and doesn’t make the shoe any heavier than necessary. With an EVA outsole, this shoe grips well when you need the extra help. 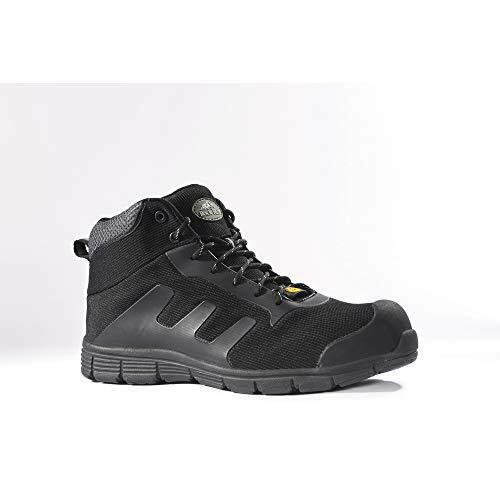 Though they are not your average work boot they still have great support and protection. If you want something very sturdy and don’t mind a traditional look then these will most likely suit your needs. They’re made from microfiber and are water repellant, so you don’t have to worry about wet feet. The upper part of the boot is also made from Sympatex Climate Control Technology which allows your feet to stay a good temperature, helping you not to sweat so much. It’s also breathable and shock resistant. They have toe caps that are crush proof so even though it’s not a steel toe you get excellent protection. 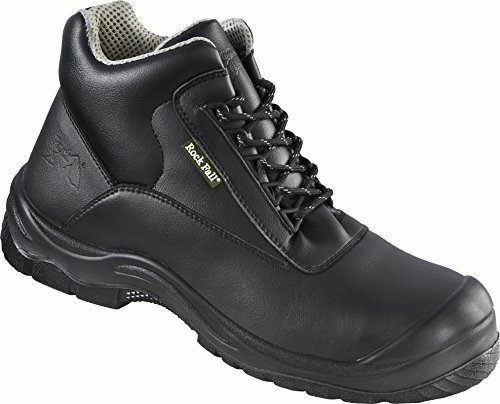 With a penetration resistant composite midsole, these boots will keep you safe in most environments. To wrap it all together, they’re ESD compliant, so if you work somewhere static ted to build up, these will keep you safe. These work boots are so comfortable, you may find you’ll want to wear them even outside of work. They have a soft synthetic leather upper portion and lace up super high, so you’ll have good protection and support. The footbed is lightly cushioned and the lining in this boot is man-made and incredibly soft allowing for additional comfort. They have an Airwair™ air-cushioned outsole so that just adds to the list of things that make this boot something you want to wear all day long. It also has good slip resistance in case things get wet. This Bogs work boot is here for the most extreme conditions. 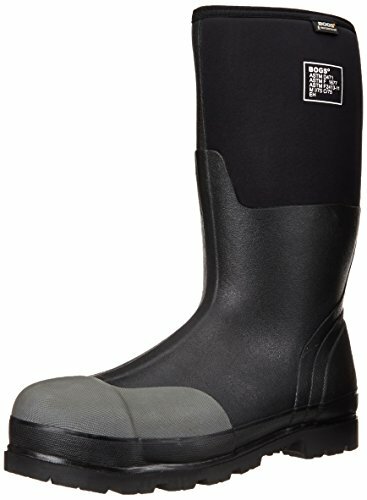 If you work in an environment where things are consistently wet this boot will get the job done. It’s completely waterproof and comes all the way up to the calf so there not much of a chance water will get through unless you’re swimming in these. They also have a steel toe for whatever accident may happen. The soles of this boot are chemical and slip resistant, so they’ll keep you safe and prevent you from falling in what could be dangerous conditions. They’re rugged and last through the roughest circumstances, you’ll find yourself buying these boots over and over again. This is another slip-on work boot. If you need something with a lot of security and a tight hold on your foot, this probably is not for you. But if you just need something comfortable, easy to put on, with adequate protection this should suit your needs just fine. It has a steel toe, so even though it’s a slip-on shoe you still get great protection for your toes in dangerous conditions. It’s made from polyurethane so it’s very sturdy and extremely easy to clean—you can even put these in the dishwasher—if you’re around a lot of messes and spills. While we’re on the topic of spills, it’s certified slip resistant. It also has a contoured footbed for extra arch support and stability. This unisex safety boot isn’t the best looking, but that not something you should worry about because what it lacks in appeal it makes up for in safety features. It’s anti-static so you can wear these in environments where electrostatic may build up. They’re non-slip so you don’t have to worry too much about spills and these being wet. It has a steel toe cap, to protect the front of your feet from accidents. In addition to those things, it’s shock absorbent and abrasion resistant and has a pierce resistant midsole. And it’s also resistant to heat, hydrocarbons, oils, and solvents. Overall this boot provides you with all the protection you could need. These are probably what you picture when you think work boot in your head. The look of these is very classic. It’s made from vegan microfiber, so it’s breathable while still maintaining water resistance. The lining in this boot is very soft and breathable as well. So, you can keep your feet at a decent temperature with these boots. They have durable TR soles with a deep tread for slip resistance and a good grip when you need it. It also has high-quality hand stitched cushion insoles to help make these more comfortable. These boots don’t stain or mark, so they’re fairly easy to clean if you get them a little dirty. And it has great ankle support with the cushioned collar and tongue.